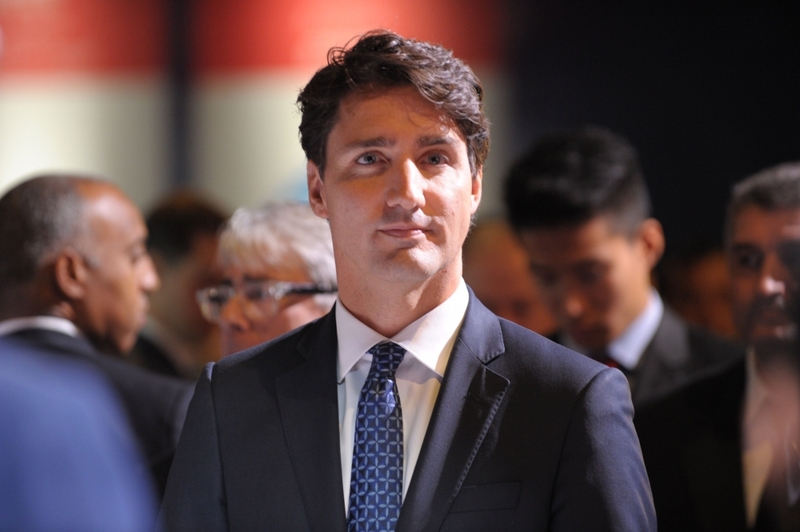 After two days of meetings with several business groups and Asean leaders, Canadian Prime Minister Justin Trudeau's first trip to Singapore in his current capacity took a more personal turn. On Thursday afternoon (Nov 15), the 46-year-old paid a visit to Fort Canning Park, taking a short walk across the grounds to the brick walls where a memorial plaque of his great-great-great-great-grandmother Esther Farquhar Bernard has been placed. She is the daughter of Major William Farquhar, the first British Resident and Commandant of Singapore from 1819 to 1823, and Antoinette "Nonio" Clement, a Malaccan woman of French-Malay descent. Mr Trudeau spent a few minutes gazing at the plaque, before stooping down to take a video with the plaque that he sent to his family members. He was presented with a plate bearing a drawing of a kingfisher from the William Farquhar Collection of Natural History Drawings from the National Museum of Singapore, and shown the memorial plaque of another family member - William Clark Farquhar, a grandson of Major Farquhar. "It was a very touching moment to see the history of my family, to appreciate all the criss-crossing, weaving links that make up each of our stories," said Mr Trudeau. Fort Canning Hill also has a special connection to Major Farquhar. When he first arrived here with Sir Stamford Raffles in 1819, he had climbed up the hill and hoisted the Union Jack. At a dialogue with National University of Singapore students earlier in the day, Mr Trudeau drew laughs when he mentioned a historical perspective that suggested that Major Farquhar, who shaped Singapore as a trading post between 1819 and 1823, was more important in establishing Singapore. "I'm not horribly biased, I will defend my fifth-time great-grandfather," quipped Mr Trudeau, mentioning how Major Farquhar had been dismissed from Singapore in 1823 after a bitter quarrel broke out between him and Sir Stamford Raffles. "He was banished by Raffles after a few years for having been too close to the locals and allowing for gambling, and allowing them to keep some more of the cultures and traditions than the British and Raffles wanted. "When he was banished, the harbour was apparently filled with little boats and people lining the shores to say goodbye to him in memory. It was a neat piece of history," said Mr Trudeau. He added that it was his mother, Mrs Margaret Trudeau, now 70, who had found the historical connection when she was approached by producers of a Canadian television programme featuring famous Canadians tracing their genealogical roots, and took a trip here to learn the details. Mrs Trudeau's journey of discovery, covered in a 2008 Canadian television programme, revealed that Major Farquhar's daughter Esther married a British army officer in 1818, but he later left her. The show said she had a tough life in Singapore, raising five children and dying at the age of 41, almost penniless. In a interview with The Straits Times in 2007, Mrs Trudeau said she always felt that she had Asian roots, because of an interest in Buddhism and Confucianism. The National Library helped with her research and her ancestor's grave was located. "We certainly know a lot about the Sinclairs (her maiden name), but very little about my mother's side. And I feel very much that Esther has entered into my spirit," she said. Plans are currently underway to restore the rich history of Fort Canning Park. Earlier this year, 18 trees were planted in the soon-to-be Farquhar Garden. When completed in June next year, it will take over the current Stamford Green, and will include plants originally grown by Major Farquhar.